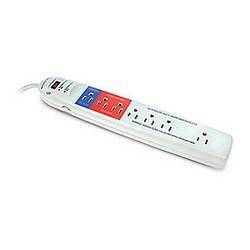 The Smart Strip surge protector lowers your energy bills by turning off your computer's peripherals when it is shut down. Four "automatically switched" outlets are all turned off when wattage through the "control" outlet drops below a user-settable threshold. Over time, this can save you tremendous amounts of electricity (and money). The Smart Strip also has 2 "constantly hot" outlets that maintain a constant current to devices that require it. All those AC adapters cease their "idling" drain of 4 to 60 watts.